Pelita Jaya celebrated back-to-back wins at the start of the FIBA Asia Champions Cup SEABA Qualifier. They rallied past Red Baron of Malaysia in the opener. 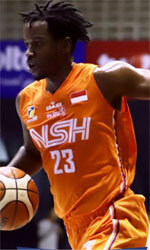 Adrian Forbes (211-F/C-88, college: Auburn, agency: Haylett Sports) stepped up with 21 points to pace the Indonesian side. Pelita Jaya used a 32:22 run in the third term to clear off for good. Arki Wisnu (187-SF-88) accounted for 14 points for the winners. Daniel Evans (173-G-83) answered with 24 points and 11 rebounds for Red Baron. Pelita Jaya cruised past Singapore Xin Hua 96:70 in the second game. Valentino Wuwungan (193-C-89) posted 17 points and 10 rebounds to lead the winners. Xaverius Prawiro (182-SG-86) accounted for 16 points in the victory. Han Xingyuan (189-SF-96) answered with 13 points for Singapore Xin Hua.